School Chaplain - The position is funded by the National School Chaplaincy Program (NSCP). Chaplaincy Policies and Procedures is also available. In addition to being able to readily approach these support staff, students are also encouraged to report any welfare issues to the Wellbeing team via our email address ursafe@campbellhs.act.edu.au. For more information and links about student wellbeing, please visit our Parents page. Compass sessions are a regular component of the Campbell High School timetable and enable students to explore social and emotional concepts such as positive behaviour for learning, cyber bullying, resilience and relationships. These sessions are conducted in small groups to enhance the participation and interconnectedness of the students. Students are given the opportunity to nominate for the Student Representative Council (SRC) and the year 10 Leadership Group. 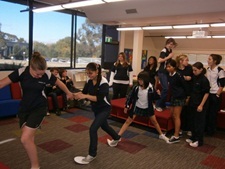 Within these groups, students engage in a number of activities including providing student voice for school-based issues, organising social activities and acting in a mentoring role for year 7 and other new students. These students also participate in a number of leadership and orientation programs at our local primary schools and in the wider community.